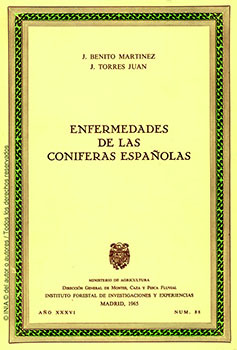 The book is a relation of the diseases of the Spanish conifers, alphabetically exposed. The results are the synthesis of 4-year collaboration between the IFIE of Spain and the USDA. It is a contribution to an international effort to identify pathogens associated with forest diseases in every continent, to determine the species that parasitize and their geographical distribution. Also to develop and improve measures to be applied, and to prevent or limit their introduction into new habitats. Of the 273 pathogens found in pine and fir, a considerable number of them are capable of destroying whole trees or parts, so careful must be taken to avoid its spread across continents.